The sight lines from the interior of the outback are nothing short of amazing! Practical elegance best describes the interior of the Outback. Michael Peters Design’s utilization of modern materials and clever design elements, creates an on board ambiance, just now becoming appreciated in the mega yacht world. The beauty of the surroundings can be enjoyed from anywhere within the interior of the Outback. Her unique window design on the main deck and hull opens up vistas. 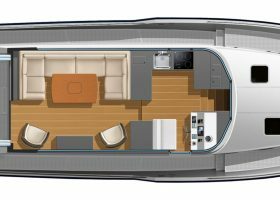 The practical and elegant blend of teak with low maintenance materials offers those on board a warm, comfortable atmosphere. 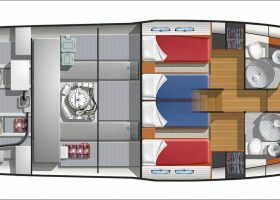 The Outback can be ordered in one, two and three stateroom configurations.